There are many sightseeing spots you should go in Tokyo city. It is good to visit major spots, but attending the local-unique events held in certain period would make your trip better. Today, we will introduce some events held in Tokyo in February that you should check. 「The table wear festival」 will be held with the concept that improvement of diet and culture table wear. It has about 280 thousand of visitors every year, the cultural event that provides the promotion of lifestyle. Various cups and bowls from not only domestic but also overseas will be displayed in several ways. As a special project, 「the UK – Style of Life -」 that represents England’s lifestyle with table, 「Beauty alive in the bowl ~Kasama Yaki・Mashiko Yaki～」 that allow us feel Kamamoto’s individuality, 「bright・colorful・beautiful table」that is coordinated by the theme color of each country will be displayed. In addition, we can check the new products and presentation from foreign brands, and purchase each bowls that produced by domestic pottery producers at 「exhibition and sale corner」. The largest exhibition in Japan 「26th Table Wear Award ～ the contest of kind dining space」 will be also held. We can also enjoy various presentations that colors table, beautiful domestic and foreign bowls, the charm of table coordinates. There are more than 250 exhibition booths for sale, stage, seminar for visitors. ※Admission is supposed to be by 16:00. ・The name of closest station, the means of transportation and the time required to get there. Just near by 「Suidobashi Station」on JR Chuo Line・JR Sobu Line・Subway Toei Mita Line. Just near by 「Korakuen Station」 on Subway Marunouchi Line・Namboku Line. ・The name of terminal station and the time required from the station to the destination. Starts from Tokyo Station, it will take about 16 min from Korakuen Station on Marunouchi Line. ※Please check Official Website for the ticket. 2. Departs from “Railway Picture” → Bounce for “Picasso” – Door of correction is opening – Dec. 16th in 2017 ～ Feb. 12th in 2018. This event is kind of series of stations with each theme. “Railway Picture” as a starting station, the theme of picture will be changed from station to station. The terminal station is “Picasso”. These pictures have been gathered little by little for past 30 years. First the first station, we can see Japanese paintings, Western paintings, pictures historical documents from Tokyo station to next station. The 2nd station is “metropolitan and suburb”. There are western paints that describe different Tokyo city from the current Tokyo city, the paint made from each separate memories of author, the actual scenery paint. The 3rd station is “people” who use and manage a railway. At the 4th station, there are introduction of “abstract” art. And at the terminal station “Picasso” known as “incomprehensible art”, there are 4 Picasso’s art exhibition drawn at different times of his life. In addition, some productions that used to be displayed at Tokyo Station Gallery will be included in this event. The amount of paint arts that displayed in this event would be about 100 including the original paint drawn by Ichiro Fukuzawa at stained glass in Tokyo station, “The image for the future of modern Art” that was held when the Tokyo station temporary closed, the paint arts that were displayed at 「100-year memory of Tokyo Station」 held in 2014. 3.Yayoi Kusama Museum Open Anniversary Exhibition 「Creation is work with aloof. Love is very the steps to the art.」 – Oct. 1st in 2017 ～ Feb. 25th in 2018. Yayoi Kusama Museum is located in Shinjuku, Tokyo. Not so big but has 5-storey including full of author’s attractive points. As an opening event, 「Creation is work with aloof. Love is very the steps to the art.」 is holding there. This event is mainly consists of the series of her latest paint art “Waga Eienno Tamashii – My Everlasting Soul”. In addition to 16 paint arts of “My Everlasting Soul”, “Aiwa Tokoshie – Love Is Forever” that is from black and white drawing series, the newest installation paint arts that was drawn for this opening ceremony are displayed. Even on the roof garden, the pumpkin cubist art is displayed. She is one of the famous Japanese artist even overseas. Though she is already 88 this year, her activity as artist is getting busier nowadays. We can feel such power and creative sense in this museum. We need the ticket in advance (it can be purchased 1st in every month before 2 months). We should note that customers will be replaced 4 times in a day. ※Close on Monday to Wednesday. About 6min walk from east exit of 「Ushigome Yanagicho Station」 on Subway Toei Oedo Line. About 26 min by car from Tokyo station. There is not group discount. In order to provide with safe and comfortable time in the museum, we would like to allow reserved 50 persons with 90 min at once, and shift the audience at 4 times on a day. You can purchase the ticket from 1st in every month for 2 months in advance. Change the date and payback after purchase will not allowed. You can purchase the ticket below. 4. Leandro Erlich Exhibition：The real for staring – Nov. 18th in 2017～Apr. 1st in 2018. 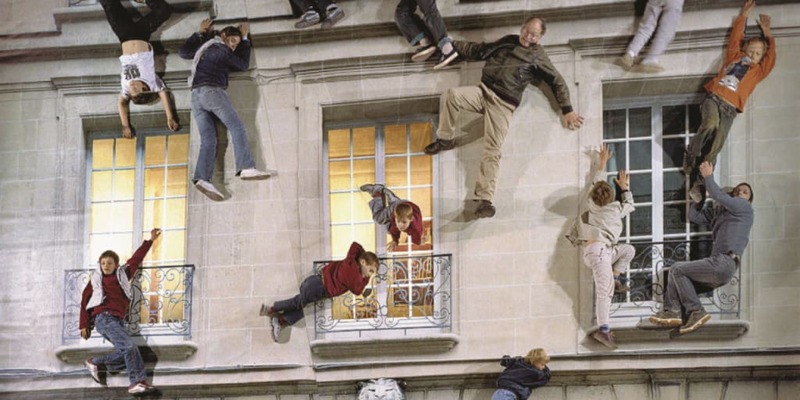 Leandro Erlich is the artist from Argentina who has various activities all over the world. In Japan, he is known as the author of “Swimming・Pool” installed at Kanazawa 21 Century Museum. This world-biggest scale of exhibition shows his all activities. About 40 arts created between 1995 and 2017 are gathered in this event, and 80% of them are displayed at the first time in Japan. His arts tend to use visual trick and sound effect to shake our common sense, such like that the ship is floating nowhere even though there is no water, people are stuck on the wall with various posing. These scenes make us surprised and feel strange. And another character of his art is that the art itself allow people be part of the art and enjoy taking a picture. It would be the new experience for you. We can enjoy if we don’t familiar with modern art. Please visit this museum to find the surprising experience. ＊Admission before 30 min of closing time. Kameido Tenjin shrine has started it’s history when the Shinto priest sculpture the statue of Tenjin with a twig of an plum tree. 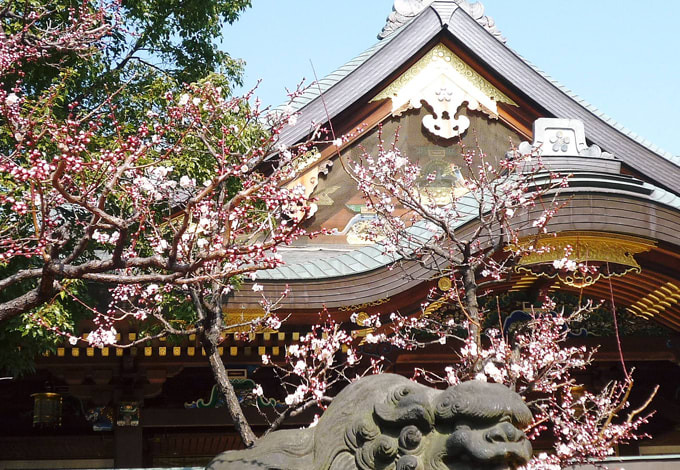 There are about 300 of plum trees and all are treated carefully by Shinto priest. In the shrine, there are also plum trees around the Shinji pond. Kameido Tenjin will give us the good luck for study. Especially in January and February, there would be so crowded with a lot of students. They can purchase a talisman for academic achievement or success in a recruitment exam. The prayer needs 5000 yen and application is accepted at office next to the shrine from 9:00 am to 16:00 pm. There will be lots of events held in Feb. 28th. We can enjoy Amazake, tea, Edokiriko (Glass Art) sale exhibition, and Kameido specialty market between 11:00 am and 15:00 pm. And during that time, Aozora personal exhibition and Kameido Tenjin Hand Made Market will be held. About 15 min walk from JR Kameido Station. About 30 min by train from Tokyo Station. Yushima Tenjin 「Ume Festival」 has 450 thousand of visitors in every year. It has become Japanese famous and seasonal tradition in early spring. From early February to early March would be the best time to visit plum garden. We can enjoy about 300 of plum trees that are about 70 or 80 years old. In the Plum Festival, various events such as Mikoshi No Togyo (it is that Mikoshi goes out around), Nodate (it is tea or Maccha party for 600 yen), Karaoke contest, Matoi Parade, the act of dedication with something to the god of a shrine (Yushima Tenjin Hakubai Taiko, Ohayashi, Japanese Dance, Shamisen, Kodan, Rakugo, and Belly Dance), Satsumabiwa, Flower Exhibition, Specialty Exhibition (Ishikawa Noto-cho, Fukushima, Kumamoto Kamiamakusa) are held and often featured in the TV news as one of the early spring events in Japan. The event is held mainly on Saturday and Sunday. About 2 min walk from Yushima Station on Tokyo Metro Chiyoda Line. About 16 min from Tokyo Station by walk and train. Shirosake Festival at Kumano Shrine is originally from the local village festival praying for the rich of harvest. It has about 660-year history. 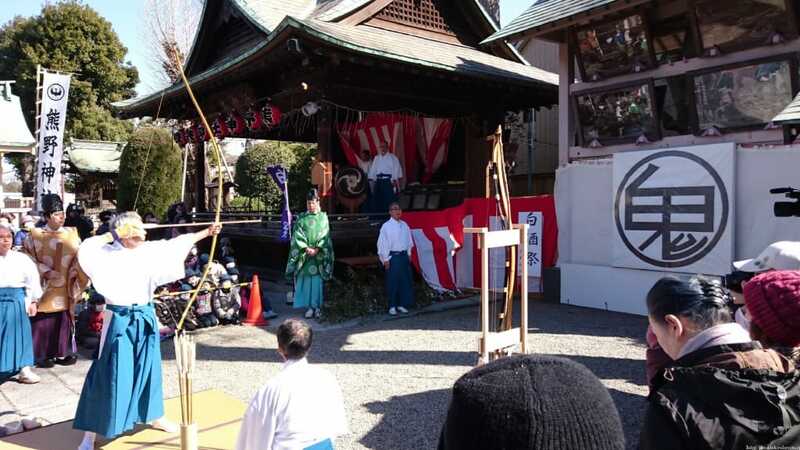 In this festival, 「Obisha (shooting an arrow at a 1.8m-size point written “Oni”)」 will be held for warding off bad luck. They shoot 3 arrows and there is a custom that one of those 3 arrows is supposed to be out of the point. When they got a success in shooting at a point with rest of 2 arrows, the Oni is destroyed. The name of this festival “Shirosake Festival” comes from that there use to be a river behind the shrine, and they made Shirozake from this clean water of the river. Currently, Amazake and Mochi shaped Tanzaku are provided to visitors as a lucky dishes. 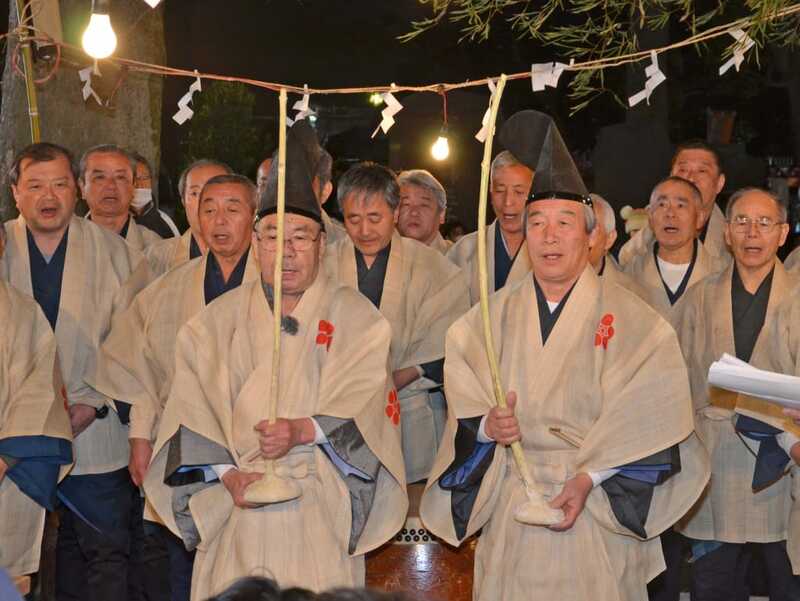 The old song that have been passed down since ancient times, named 「Shirosakeno Uta」 is also performed in the festival. Tokumaru Kitano Shrine has been established in 995. Ta-Asobi is the event held at this Tokumaru Kitano shrine on old new-year-day praying for rich of harvest and leaving a numerous offspring. During the event, people recite the words that stands for the process of rice crop. And they scatter the seeds of rice crop to the beat of Japanese Drum, and toss the child who is acting as a female rice planter one by one praying for growth of children and crop. It is named 「Doage」. In addition, they heap up the instruments used in Ta-asobi on the drum, and clasp their hands together. It is named 「Inamurazumi」 that is designated National Important Intangible Folk Cultural Property. Get on the bus bounce for 「Ukimafunado Station」 or 「Takashimahira Station」 from Tobu Tojo Line 「Tobu Nerima Station」. And about 5 min walk from 「Tokumaru Rokuchome」 bus stop. About 49 min by train and bus from Tokyo station. The Yoyogi Hachimangu located in Shibuya-ku, Yoyogi. In every year, Mochitsuki Tournament is held there by Yoyogi Mochitsuki Uta Preservation Society. This is the Mochitsuki event that people do Mochitsuki while singing 「Yoyogi Mochitsuki Uta」. In this Yoyogi district, there use to be the custom that each farmers visit 5 or 6 houses and hold the Mochitsuki for celebration of New-Year-Day. There has been also the custom that they do Mochitsuki while singing a song. Yoyogi Mochitsuki Uta Preservation Society has been trying to keep and pass down the song. The Mochi made in Yoyogi Hachimangu will be literary scattered with beans on Feb. 3rd “Setsubun Festival” as a good lucky dishes. General people can also join this festival. Please have a good experience of Mochitsuki in Japan. About 5 min walk from Odakyu Line 「Yoyogi Hachiman Station」. About 5min walk from Yoyogi Uehara Exit of 「Yoyogi Koen Station」 on Tokyo Metro Yoyogi Line. About 30 min by Tokyo Metro Line from Tokyo Station. Nakanobu Skip Road is shopping street that runs between Ikegami Line Ebaranakanobu Station and Oicho Line・sakusa Line Nakanobu Station. It is 330m length. 「Ekiben Tournament」　has been held here and has 40-year history. This tournament has a theme that “we can feel as traveling in Nakanobu”, and many good Ekiben can be purchased here. 「Ekiben」 means the Bento sold in the each station. Each Ekiben has full of local specialty. We can see, choose, and eat several Ekiben from all over Japan in this event. It seems that the popular Ekibens are 「Hipparidako Meshi」 from Nishiakashi Station in Hyogo, 「Gyuniku Domannaka」 from Yonezawa Station in Yamagata, and 「Tokusen Masunosushi」 from Toyama Station in Toyama. There are also another popular Ekiben. Let’s check and join the event! 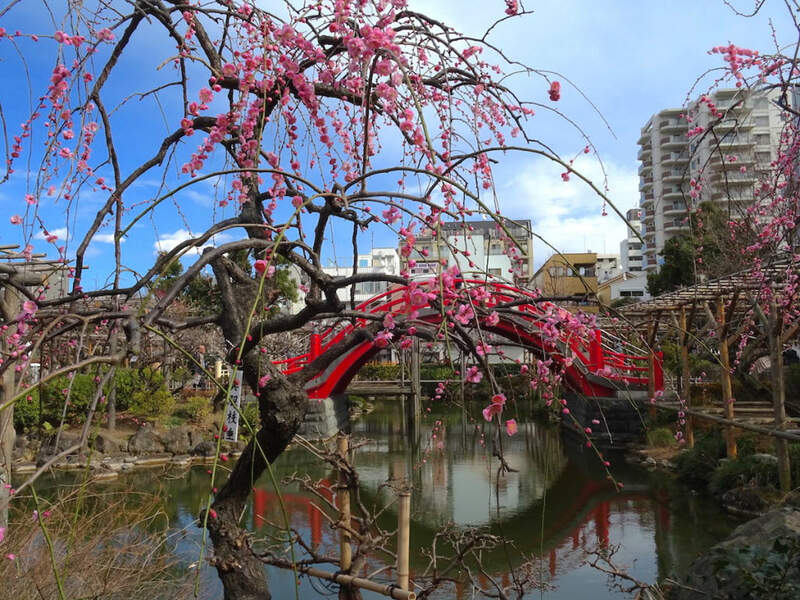 1 min walk from Nakanobu Station on Toei Asakusa Line. About 30 min by train on Yamanote Line and Toei Asakusa Line from Tokyo station.